If you have an e-commerce website, then SSL is mandatory for safely processing credit cards. But even if you aren’t processing payments, you should still seriously consider secure HTTP (or HTTPS), especially now that I’m going to show you how to set it up quickly, for free. Let’s get started. In short, SSL is the “S” in HTTPS. It adds a layer of encryption to HTTP that ensures that the recipient is actually who they claim to be and that only authorized recipients can decrypt the message to see its contents. If you have an e-commerce website, then SSL is mandatory for safely processing credit cards. But even if you aren’t processing payments, you should still seriously consider secure HTTP (or HTTPS), especially now that I’m going to show you how to set it up quickly, for free. Let’s get started. Credibility. Even non-technical audiences associate the little green padlock in the browser’s address bar with trust and reliability. Password protection. Perhaps your website only hosts kitten videos. But if users are logging into your website via Wi-Fi with a password that they also use for online banking, then you are potentially facilitating a serious security breach by broadcasting those credentials publicly. Future-proofing. Many websites are still served via HTTP, but there is an undeniable trend towards HTTPS, and this will only increase as users become increasingly educated about web security. Be on the right side of history. SEO. Google officially announced that HTTPS is used as a ranking signal. In other words, Google is rewarding HTTPS websites by boosting their rankings in search results. The first step to setting up HTTPS for free is to sign up for a cloud DNS service. If you have no idea what DNS is, I recommend that you take a minute to learn before proceeding. The delightful How DNS Works does a great job of breaking it down into a quippy cartoon. Otherwise, simply know that DNS is the system whereby domain names like example.com (which humans understand) get linked to IP addresses like 104.28.2.167 (which computers understand). You have many options, but I’m a fan of CloudFlare because it’s really fast to set up, the dashboard is intuitive, and a free plan is available with many powerful features. 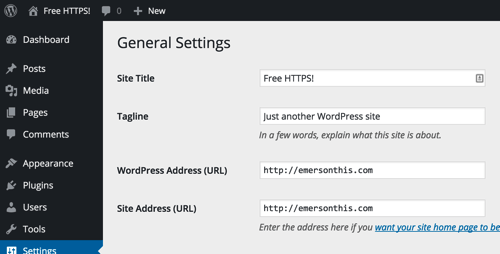 WordPress has a core function named is_SSL() that plugins rely on to determine whether traffic is encrypted with SSL. With the method above alone, this function will return false because the encryption is only between CloudFlare and the client. The traffic that PHP interacts with is unencrypted, so the super global that that function checks (i.e. $_SERVER[‘HTTPS’]) would not be useful. For our purpose, the relevant variable is $_SERVER[‘HTTP_X_FORWARDED_PROTO’], which, at the time of writing, WordPress does not recognize. The request to change this is long-standing, but it is yet to be resolved.